Because there is no one face of hunger, multiple solutions are called for. Community-based solutions—local and familiar—are key to reaching the 700,000 people across the state who struggle with food insecurity. From meals programs to improved access to SNAP and farm-to-table resources, Project Bread anticipates and responds to both immediate and longer term needs by providing solutions that are equal to the range of challenges: solutions that are easy to access, make self-sufficiency a priority, incorporate the knowledge and resiliency of the people most deeply affected by food insecurity, solutions that don’t stigmatize or demoralize. In 2013, Project Bread invested more than $5 million in soup kitchens, food pantries, health centers, summer meal programs, elder meal programs, our FoodSource Hotline and more—all to reach the state's most vulnerable populations: children, working poor families, immigrants, and seniors—and to bolster our local food economies. Funds raised throughout the year help support over 400 community food programs—soup kitchens, food pantries, food vouchers at health centers, summer meals, subsidized CSA shares, community gardens, double-value farmers market coupons, etc.—in over 130 communities across Massachusetts. Food pantries and congregate meals in community centers, religious centers, and other locations provide immediate assistance for those in need. SNAP (the Supplemental Nutrition Assistance Program, formerly known as food stamps) is the cornerstone of the nation's nutrition safety net, and Project Bread is dedicated to removing barriers and increasing access to this important program. The program helps low-income workers stretch their food budget, buy healthy food, stay independent, and maintain their dignity. Through our FoodSource Hotline, Project Bread provides over 46,000 callers a year with information about SNAP and helps them with the application process. GettingSNAP.org—a bilingual resource created by Project Bread—helps 650,000 unique visitors annually determine their eligibility. And SNAP is good for local economies: every SNAP dollar spent generates $1.84 of economic activity. Families feel safe and respected when they ask for help at a health center. They can discuss their struggles to make ends meet and their deep concerns about being able to feed their children well and keep them healthy. Project Bread trains clinicians in over 25 health centers statewide to identify people in need, raise awareness about the FoodSource Hotline, provide food vouchers, and connect people to Project Bread’s two full-time SNAP outreach coordinators for application assistance. An astounding 11% of families in Massachusetts’s health centers screened positive for severe food insecurity. Project Bread's FoodSource Hotline connects food insecure people with public resources and local help, in order to help them find the right solutions for their needs. The Hotline answered over 46,000 callers from across Massachusetts in 2012, and is the only comprehensive statewide information and referral service in Massachusetts for people facing hunger. 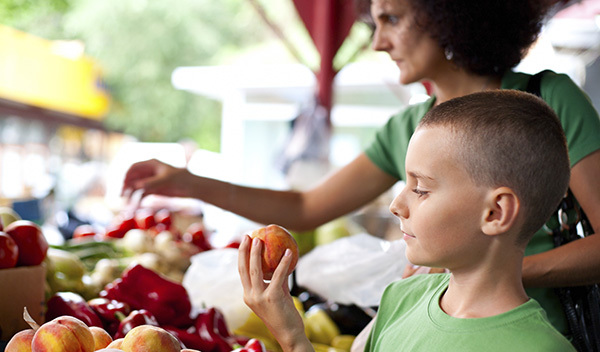 Counselors connect callers to a multitude of available resources in their community, including food pantries, congregate meal sites, school meals, and summer meal sites for kids, elder meal programs, and WIC. When relevant, FoodSource Hotline counselors also connect callers with other resources such as utility and fuel assistance, and MassHealth. Most importantly, our counselors can start SNAP applications for eligible residents right over the phone. Click here to get help. Good nutrition is essential for older people: it shields them against a range of debilitating conditions. Project Bread provides immediate hunger relief through food vouchers—gift cards that can be used at local grocery stores—as well as help to homebound elders. And we help assure continuous nutrition by assisting them in SNAP enrollment. We also help seniors take full advantage of the Massachusetts Elderly Nutrition Program, connecting them with resources like congregate meals that help to expand their food budgets. And we partner with AARP to expand our reach. Click here to get help. Project Bread knows that school meals are one of the best ways to ensure that low-income school children receive the nutrition they need to learn, grow, and thrive. To transform school meals and maximize their benefits, Project Bread works to fully enroll low-income children in federal nutrition programs, improve the quality of the food served, and teach school food (and preschool!) kitchen staff and parents how to prepare nutritious, fresh meals on a limited budget—food that children will enjoy—and food that will start them on a lifetime of healthier eating habits. Learn more. Donate now and help fund local solutions in over 130 communities across Massachusetts.